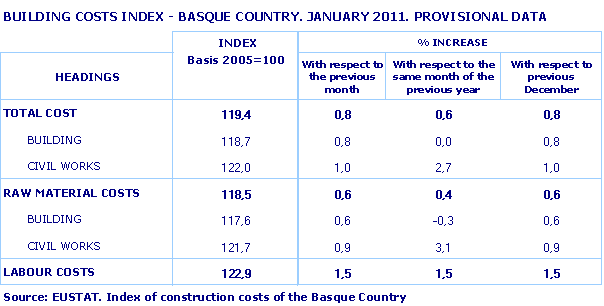 The Construction Costs Index of the Basque Country rose by 0.8% in January 2011 with respect to the previous month, which meant that the year-on-year rate for that month was up by 0.6%, according to EUSTAT data. In January 2011, labour costs increased by 1.5%, whereas raw material costs rose by 0.6%. The Building and Civil Works sub-sectors saw their raw material rise in price in January, with a 0.6% increase in Building costs compared to the previous month and 0.9% in the case of Civil Works. There were differences between the year-on-year performances of both sub-sectors: building raw material costs fell by 0.3%, whereas those for Civil Works accumulated a 3.1% increase. Coke Plants & Oil Refining (20.3%), Electricity, Gas & Steam (20.1%),Metallurgy (18.4%) and Rubber & Plastic Products (6.1%) stood out among the prices of raw materials used by the sector that had experienced the highest inflation rates over the last twelve months. On the other hand, the annual prices (January 2011 compared to January 2010) of raw materials decreased or posted smaller increases in the following sectors: Extraction Industries (-7.3%), Timber & Cork, except Furniture (-0.4%), Non-metal Industry (0.8%) and Electronic & Computer Products (0.9%). 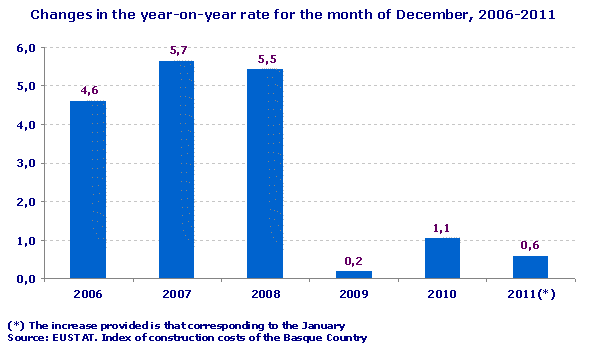 Coinciding with the publication of the Construction Costs Index of the Basque Country for January 2011, Eustat has implemented a change in the Classification of Economic Activities (CNAE) used to prepare the index. Thus, the CNAE-93 classification used up until now has been replaced by the CNAE-2009.